A photograph of Bhagat Singh Thind and his wife Vivian, posing with Prime Minister Jawaharlal Nehru and another unidentified figure. Thind visited India in June 1963, for the first time since he left in 1912. Congressman Dalip Singh Saund from Life magazine photoshoot. Representative Dalip Singh Saund posed next to a bust of President Abraham Lincoln, from Life magazine photoshoot. 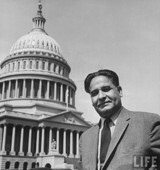 Rep. Dalip S. Saund, standing in front of the Capitol Building. Rep. Dalip S. Saund of California standing in front of Coachella branch of All American Canal. Rep. Dalip S.Saund (R) listening to Sen. Lyndon B. Johnson (L) speaking.